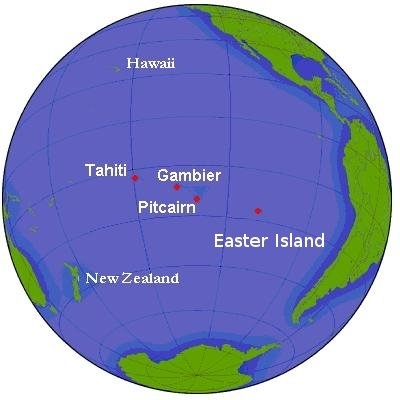 I stumbled upon this Wiki Article about the Pitcairn Islands as I was looking through the list of country calling codes, trying to find out where my sister sent me a text message from (somewhere central america). There are 3 places with no calling code: Antarctica, Kerguelen Archipelago and Pitcairn Island. If you’re looking for freedom and a place where (almost) nobody and nothing will disturb your peace, this is it. Pitcairn is literally in the middle of nowhere. In the middle of the Pacific Ocean to be correct. There are exactly 48 people living on this island, which has an area of 4.6 km² (1.7 mi²), that’s about the size of Central Park, and there’s no harbour or airport and no landline telephone or TV. There is, however, “one Government-sponsored satellite internet connection”. But apart from that, the islanders are pretty much on their own. Find out more about the island here and here and here.